Strategy 2030 is the new long-term plan for the Asian Development Bank’s (ADB) strong com­mitment to eradicate ex­treme poverty in Asia and the Pacific. 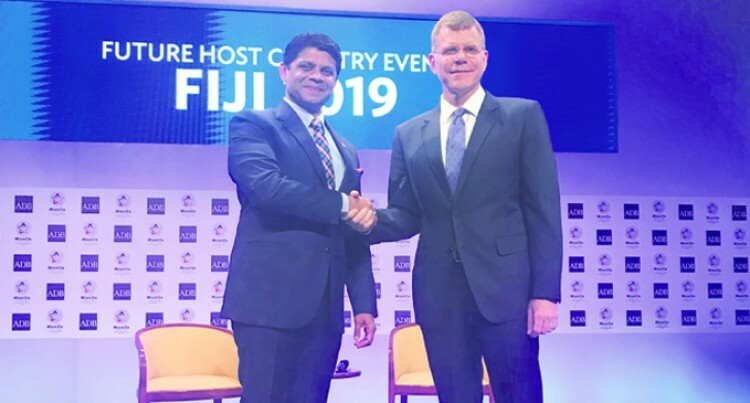 The strategy to be released later this year will also ex­pand the bank’s vision to achieve a prosperous, inclu­sive, resilient, and sustain­able region. This was highlighted by the ADB president Take­hiko Nakao while deliv­ering his address at the Opening Session in Manila Philippines yesterday of the Board of Governors during the 51st ADB Annu­al Meeting. With the theme “Linking People and Economies for Inclusive Growth,” 4,000 delegates from member governments, academics, business leaders, and civil society representatives at­tended this year’s Annual Meeting. Strategy 2030 which is in the consultation process, he said, highlighted the ADB’s achievements in 2017, its continued solid growth of Asian economies, and im­pacts of new technologies on jobs. Mr Nakao also highlighted that the Strategy 2030 will address existing and emerg­ing challenges. “There is still persistent poverty,” said Mr Nakao. “We must address rising inequality, growing envi­ronmental pressures, and rapid urbanization. Strategy 2030 will be aligned with the interna­tional agenda, including the Sustainable Development Goals and the Paris Agree­ment on climate change. (10) pursue a stronger, bet­ter, and faster ADB. “We will continue to use our financial resources effi­ciently and creatively,” Mr. Nakao said. “We will invest in our workforce, promote diversity including gender balance, and ensure a re­spectful workplace. We will expand our presence on the ground. We will dramati­cally modernize business processes to speed up our services to clients. “A One ADB approach will break down silos and bring together expertise across ADB,” he added. Mr Nakao appreciated the strong support of the Phil­ippines as ADB’s host coun­try since 1966 and thanked the government and its people for the excellent ar­rangements and warm hos­pitality. ADB, based in Manila, is dedicated to reducing pov­erty in Asia and the Pacific through inclusive economic growth, environmentally sustainable growth, and regional integration. Estab­lished in 1966, it is owned by 67 members—48 from the region. In 2017, ADB operations totaled US$32.2 billion, in­cluding US$11.9 billion in cofinancing.